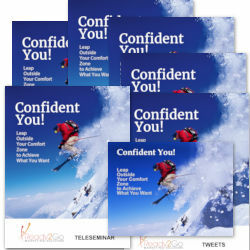 Teleseminar & Self-Study Coaching Program: Transitions and Transformations - Thriving in the Midst of Change from Ready2Go Marketing Solutions, Inc.
Confidence plays an important part in living the life we want. Research indicates that successful people believe they create their lives rather than life being something that just happens to them. It’s simple: without confidence, we will not be able to achieve our goals. Confidence is a necessary quality everyone needs, yet so many struggle to find it, not realizing that it naturally exists within each and every one of us. We don’t feel we possess confidence because we have bought in to the thinking that we just can't do anything right, or that we are not as smart, fortunate, charismatic, or just plain talented as everyone else. More often than we realize, we let our fears and doubts weaken our natural confidence and by doing so, we end up thinking in negative terms about ourselves and what’s possible for us. From here, we end up selling ourselves short. We start seeing all the reasons why something isn’t possible for us. We become preoccupied with what we might lose rather than seeing what we are capable of gaining. We focus on the possibility of failure and criticism and dismiss any possible positive outcome to our efforts. Our fears and doubts paralyze us. They prevent us from taking bold action and cause us to continually think negatively. The secret to being more confident lies in your ability to better manage your mind and the doubts and fears it produces. Your conscious mind can hold only one thought at a time, so why not make it a positive one. We can change the world around us once we recognize our ability to choose the perspectives and emotional responses we hold. Confidence is an inner feeling of certainty. Confident people have faith in themselves and their abilities. They believe that they can meet life's challenges successfully and have the emotional energy necessary to create their dreams. 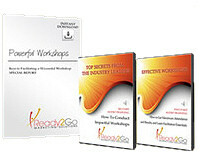 In this program, your participants will recognize what holds them back in confidently pursuing what they want. They will also see the connection that exists between their doubts, fears, and the thoughts they hold. Participants will realize how they can choose their perspective and emotional response to almost any situation. Additionally, they will be able to assess the positive or negative energy associated with the emotions they experience. Your attendees will learn to embrace the idea that they can meet life’s challenges successfully. Explore how experiences, surroundings and perceptions can drive their fears and make them feel less confident. Identify their doubts and fears. Recognize they can choose a perspective that can increase their level of confidence. Gain a new outlook on how to remain in a positive, Confident You place. Part I – What Holds us Back? We will explore how our memories and emotional connections impact who we become. Participants recognize how our experiences, surroundings, and perceptions can drive our fears and make us feel less confident. 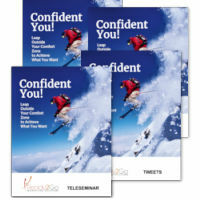 We will explore how our doubts and fears impact our level of confidence. Participants identify their doubts and fears. We will explore how we perceive a burst of energy when faced with a challenge. Participants recognize that many perspectives exist around how we choose to look at a situation, and that we can choose a perspective that can increase our level of confidence. We will explore how identifying our passions generates an emotional response within us. Participants will identify their passions and recognize the emotional response this generates within them. They will discover 4 steps to help them remain in a positive, Confident You place.